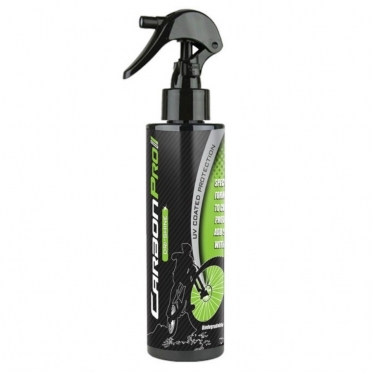 Clean and protect your bike with CarbonPro Bike Cleaner with UV Protection 450ml. Protects against UV rays, paint discolouration and corrosion. The biodegradable formula is also kind to the environment. CarbonPro Bike Cleaner is the only cleaner in the market specially formulated to clean and at the same time protect the bike. Protect the bike agains UV rays, paint Discoloration, Corrosion from Salt, Sweat, Water, Snow. CarbonPro Ultra Shine & Protectant with UV Protection 240ml will make your bike look like new. Biodegradable formula protects the finish on your bike and the environment. Specifically engineered to Repair and Protect Carbon Fiber bicycles, this incredible product will add shine and protect against scratches, UV, and environmental agents at the same time. This product will also make the bike look brand new with an incredible shine. Perfect for shiny and matte surfaces. 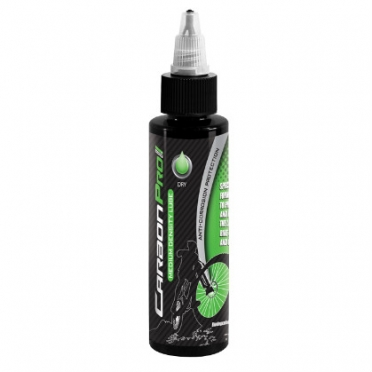 CarbonPro Dri Shine/Wash with UV Protection 240ml Protection allows you to clean your bike without water. The Biodegradable formula also protects against UV rays, salt water and sweat. The revolution in bicycle cleaning and care, wash your bike everyday, anywhere, anytime without the need of water. This product will encapsulate dirt and grime and it will remove it without leaving any residue, or streaking. 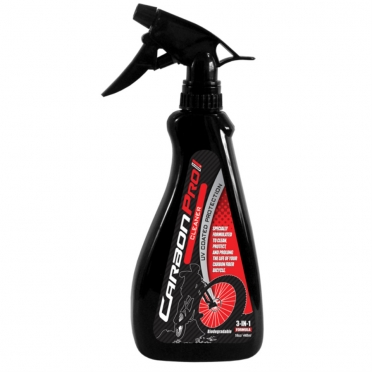 CarbonPro Chain Cleaner with UV Protection 240ml is fast acting and tough. Solvent free and biodegradable, the special formula also helps protect components from corrosion, Potent and Bioencimatic Degreaser. Will remove the toughest grease stains and grime from the chain and metal components without causing any harm. No Harsh chemicals, salt, or sulfates and provides ultimate protection against UV rays, salt and Corrosion. CarbonPro Lite Dry Lube 120ml, Its perfect for daily application to protect the chain and metal components from debris, grime and corrosion. It applies dry, perfect for long rides. Biodegradable and Eco-Friendly. CarbonPro Wet Heavy Duty Lube 120ml is a very strong lubricant that ensures that your rotating parts remain well protected. Even during the most extreme weather conditions. It allows water and dirt ingress and therefore goes against corrosion. 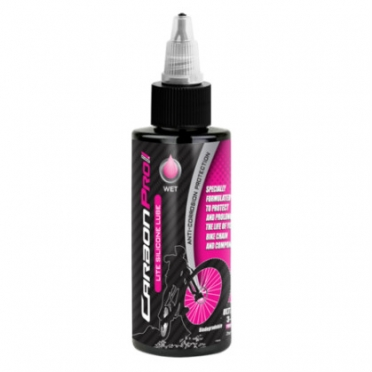 The CarbonPro Wet Lite Lube 120ml is specifically designed to provide protection during wet conditions. This lubricant ensures that water does not penetrate into the rotating parts and therefore goes against corrosion. Die CarbonPro Dry Medium Lube 120ml ist das ideale Schmiermittel für alle beweglichen Teile am Fahrrad. Vor allem, wenn die Straße oder der Boden staubig und schmutzig ist kommt dieses Schmiermittel zur Geltung. The CarbonPro Wet Lite Lube 50ml is specifically designed to provide protection during wet conditions. This lubricant ensures that water does not penetrate into the rotating parts and therefore goes against corrosion.